Karen Dodd continues the heart-pounding twists and turns of her debut novel, Deadly Switch. 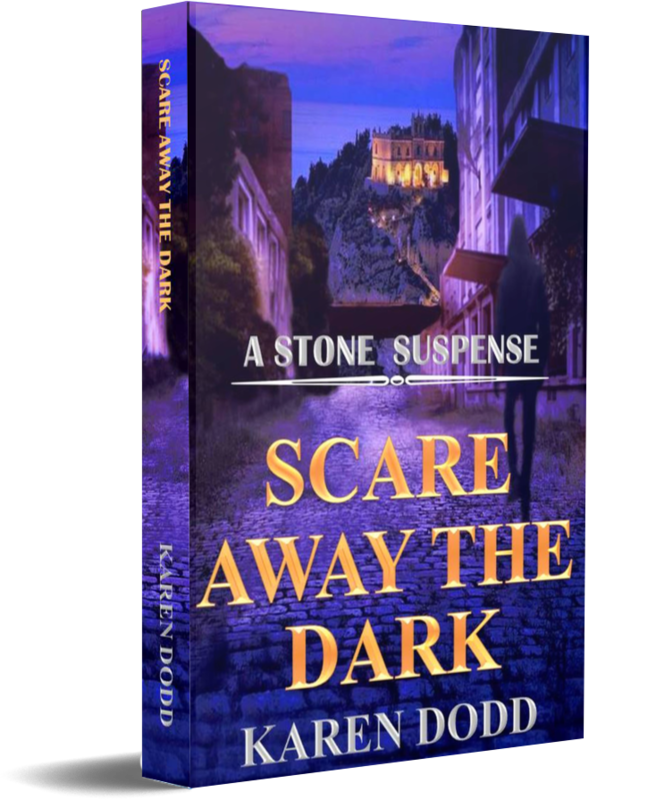 In Scare Away the Dark, the second book in the Stone Suspense series, her taut and riveting characters race against the clock as they hunt down a ruthless adversary before he strikes again. Investigative reporter, Jordan Stone wants nothing more than to get her parents out of witness protection and reunite what’s left of her family. What does her most trusted informant say that compels her to drive out to a remote part of the Fraser Valley to follow up an anonymous tip? When Jordan vanishes without a trace RCMP inspector J.J. Quinn leads the team that eventually rescues her, but her ordeal is far from over. After a second attempt on her life Jordan flees Canada for Calabria, Italy. Back in familiar surroundings, she lets her guard down—only to discover the shocking depth and depravity of whoever wants her dead. Tortured by demons of his own and frustrated by the official lack of progress into Jordan’s kidnapping, Quinn joins forces with her to match wits against a ruthless stalker who has insinuated himself into every aspect of her life.